In September 2018 Microsoft announced a new hosted VDI platform which they’re calling “Windows Virtual Desktop“, and we’re pretty excited about it! This is a direct competitor to Amazon Workspace (which incidentally we’ve been helping a large enterprise adopt) but Windows Virtual Desktop has a unique feature which is worth calling out: It supports a multi-user Windows 10 experience. We've been helping a number of customers migrate to Windows 10 over the past year or so and the same thing keeps happening to me: I run a demo of our product MigrationStudio, and I explain how understanding your current user-base and their application usage is one of the most important steps in delivering a successful migration. But why? There's a significant difference between the installed applications on a device, and the applications each person actually uses. In almost all cases people only ever use a subset of the applications they have installed. We've done some analysis of this on real-world data and have found that typically anywhere between 25% and 34% of a typical user's applications will ever be used. This information is like gold-dust for anyone planning a migration to Windows 10 because it vastly reduces the number applications we have to consider before we migrate the users, and it significantly reduces the time taken and therefore the cost. At this point, the customer normally responds that they don't have a solution in-place which provides application usage metrics. I ask "Do you use SCCM?" and the typical answer is "Yes, of course". This is the point where I explain that SCCM does track application usage, and to an extremely detailed level. Sometimes customers will say "but we haven't configured software metering" but this isn't the feature we rely on. Instead, we use the inventory feature of SCCM which is enabled by default, and captures usage of all applications which are launched with an executable file. It will track these applications regardless of how they were installed (manual installs, SCCM installed, run from a network share) and it will even track virtual applications such as App-V. And better still, it doesn't just provide a list of executable names, instead, it provides a vendor, product name and version. This is an incredibly useful resource, and most people I speak to have no idea that this exists. How can I get access to the SCCM inventory data? MigrationStudio layers Active Directory and HR data over the SCCM data allowing you to break down the application usage by department, location, office etc. 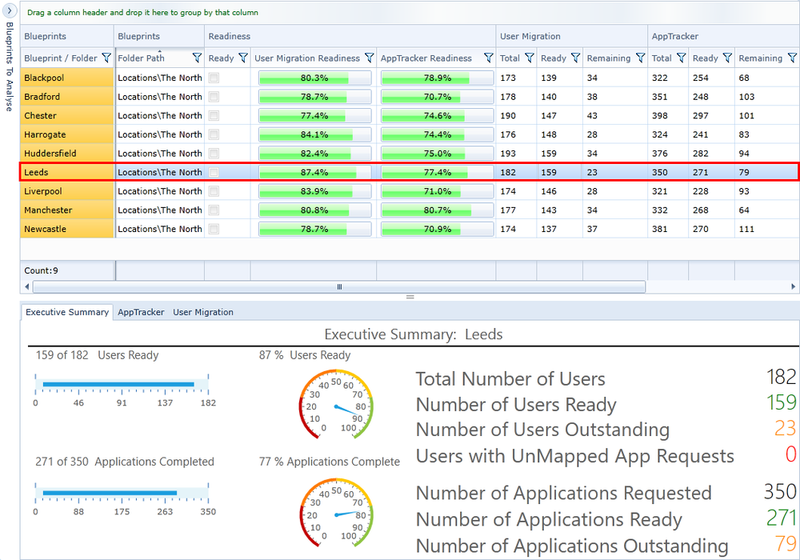 This means we can easily show you which Adobe applications were used by the Leeds office in the past 14 days for example. Simplified application rationalisation allows you to take multiple versions of a product and replace it with a single version, and automatically forward-path the users of the old versions to the single new version to make the transition to Windows 10 faster and easier. We have a large number of customers who have been extremely surprised with just how useful the SCCM inventory data is when processed by MigrationStudio. They have been able to save a significant amount of time and money with their EUC transformation projects and have continued to gain benefits of using the data post-migration to keep on top of the application management. Now with even tighter integration than previous versions. MigrationStudio could always schedule migrations but now it can also publish Apps to SCCM and create OS Migration jobs as well as monitor progress as the OS is upgraded. Having trouble scheduling 1,000’s of Users? let them schedule themselves. Cut down on User's missing their migration because… a report is due, they don't work on Fridays, they have a dentist appointment.. etc. Users can now pick their own migration slot, like picking a seat on an airplane. 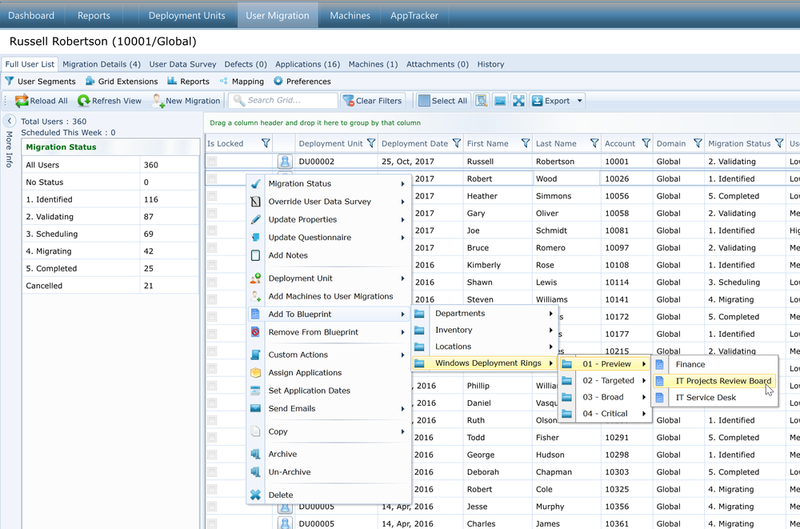 Create portfolios of Apps per department and have MigrationStudio manage assigning those Apps to the correct users. Create dependencies trees for core Apps and middleware. MigrationStudio will make sure the Users get the Apps they need. MigrationStudio can now create a personalised deployment calendar right in your Outlook. See the status of you and your team's next week without opening MigrationStudio. Extend MigrationStudio for your bespoke needs, now you can write your own plugins in PowerShell and have them appear in the MigrationStudio UI. This can be used to connect to internal and 3rd party systems that are required for the success of your project. There are two key areas that are driving organisations away from the big bang approach to Windows maintenance. One is cost and the other is risk. Businesses were finding their bottom line was being impacted every six or seven years by the cost and disruption of upgrading IT infrastructure. Many companies tried to get by or delay these costs leading to operational risk and in some cases competitive disadvantage as they struggled to keep up. The graph below shows how companies have typically managed their IT upgrades and how they are moving to a more sustainable Evergreen approach. The effort (or cost) on the y-axis shows just how much more sustainable the Evergreen model is from a management point of view and also just how much easier it is to explain to shareholders from a financial perspective. This article explains the fundamental differences in cost and risk between the traditional Big Bang migration and the Evergreen IT approach and then moves on to explain how Evergreen can be managed using MigrationStudio. Every six or seven years a company has been expected to go through a major transformation to upgrade their operational infrastructure. In terms of scope, this impacted every person, desktop, laptop, application, business unit and geographical location more or less at the same time. This was an incredible time, money and logistically intensive process. A typical big bang migration will go through the process of assessment, optimisation and then controlled deployment. Many of the logistical challenges of the big bang approach to Windows transformation have been solved through the use of Context, Communication, Self-Scheduling and Automation. Context comes from widely deployed systems such as SCCM and Active Directory. Aggregating information from these tools provides the ability to drill down and see exactly what application usage looks like in for example the Finance team of the New York Office. We can determine which machines they log on to, what applications they use and how their operational environment needs to change to support the future technology. Communication and self-scheduling empowers each and every employee throughout the transformation process, allowing them to pick a convenient time for migration that doesn't impact their business function. Automation brings this knowledge, context and self-scheduling together to enable the delivery of that migration much faster and with a lot fewer resources. In addition to these abilities, is a need to be able to look at an organisation from an Application centric perspective. Every department, business process, geographical location and employee is impacted by a Windows transformation because every employee relies on applications that are critical to their ability to do their job. One of the key challenges of big bang type migrations is understanding how it effects the company's application portfolio. Each application needs to be documented to understand who uses it, how it's installed, whether it works on the new operating system, and when it can be signed off for use in the new Windows environment. This process takes time, effort and lots of money. Is it necessary? Unfortunately yes. The stability of the entire organisation is balanced on whether applications and business processes work in the new environment. Due to the existential threat a big bang migration will have on a company, it will rightly gain a substantial amount of attention from the CEO, CFO and CIO. A CEO will be concerned with how this will impact the forward thinking strategy and direction of the company, the CFO on how it will impact the bottom line and future profitability of the company, and the CIO with ongoing operational management and change. From a governance perspective, the big bang transformation strategy is incredibly time consuming and risky. It also leads to large cost spikes in the accounts that can be difficult to explain to investors and also impact cashflow on an seemingly random basis. Evergreen IT refers to running services comprised of components that are always up to date. This is not just at the user level, but also all the underlying infrastructure, whether onsite or outsourced. With the introduction to the concept of Evergreen IT there are a few key ideas to understand. New functionality is added to Windows 10 twice a year through Feature Updates. Security and non-security fixes are released on a monthly basis through Quality Updates. As discussed earlier, from an Enterprise perspective, it is incredibly risky to update everyone at the same time and so Microsoft has introduced the concept of Deployment Rings as part of the rollout strategy. This is a very simple concept that can be managed centrally with the use of only a small number of deployment phases. Preview: A small number of users or machines would receive early builds for evaluation to establish how new functionality can be utilised within the organisation. Targeted: After a short preview period, a few members of each business unit receive a new major release to evaluate how it impacts their business processes, test application compatibility and sign off end user acceptance. Any issues prior to broad release can be dealt with efficiently without impacting the whole organisation. Broad: Once the build has been signed off for general usage in each business area, it is set for broad release across the organisation. This is generally four months after a targeted release. Critical: After an embedding period of around six months, it's time to start rolling out to critical infrastructure. All of the initial issues and concerns from the targeted build should have been ironed out by this time and a rollout to the most sensitive areas of the business can be completed. The expectation is that application compatibility between versions of Windows 10 will be high. This means that once you have a managed application portfolio, it will only be a case of pre-testing your business critical applications before the targeted pilot phase. This amounts to a significant cost and time saving. Unlike big bang transformations, the Evergreen IT approach leads to a much less risky or disruptive change cycle. This takes the focus away from the CEO and CFO as the rollout can be much more evenly managed, scheduled and budgeted from an annual cost perspective. From a CIO perspective they can start to release the reigns a little and allow business as usual teams to gain control and treat the transformation as they would any other business change environment. While there are a number of tools capable of managing the actual deployment of the new operating system it's very difficult to understand how the logistics of this can be achieved. It's easy to say there should be a Preview ring that lasts four weeks before a seamless transition into Targeted then Broad deployment. But how do you actually drive testing, communicate with your test users and collate all of the information, success criteria, remediate issues and then make a decision on whether to move from Targeted into Broad deployment? This is where MigrationStudio comes into its own. The first step is to Preview the new Operating System build. Work out which features should be removed and what features could benefit the overall business strategy. At this point you can create the core build as you would expect to release it to the whole business. This would include all of your standard core apps, fonts, language packs etc. MigrationStudio works on the concept of tracking resources such as applications, users and machines. Because of this it's very easy to additionally track operating systems, shared mailboxes, files, printers, shared drives etc. We just need to add an additional resource type. At this point, I can track all of the applications, font packs, languages etc against the latest operating system. Having access to all of this information via the API means that I could also easily create a build and add to SCCM as a deployment. In the picture above, we are adding Russell Robertson and Robert Wood to the "IT Projects Review Board" of the Preview Ring. In this way, we can set up all of our rings and define who will receive and operating system refresh and within which deployment ring. Once testing has been completed and the user has fed back to MigrationStudio, it's easy to report and make a decision on whether to release the build to the next Ring, or remediate. The picture above shows test results coming in for each Deployment Ring, who tested, when they tested and what the status is; all with one click of a button. When and if critical business applications fail deployment testing, it's easy to raise defects, remediate the application and push back through the testing environment. This can be done on an individual application level or a complete OS re deployment, depending upon the severity of the issue. Once all testing has completed successfully the build can be promoted to "Targeted Release" and the testing process can start again. Microsoft's Evergreen IT view of OS deployment makes a lot of commercial sense. From a risk perspective, having a thorough communication and test strategy is imperative to a streamlined process. With the understanding that most existing applications in a Windows 10 portfolio will work on newer releases, it makes life much easier to transition the whole process from Project Management into BAU (Business as Usual). Microsoft have created a very simple concept for OS deployment. Behind that concept is a logistical challenge. 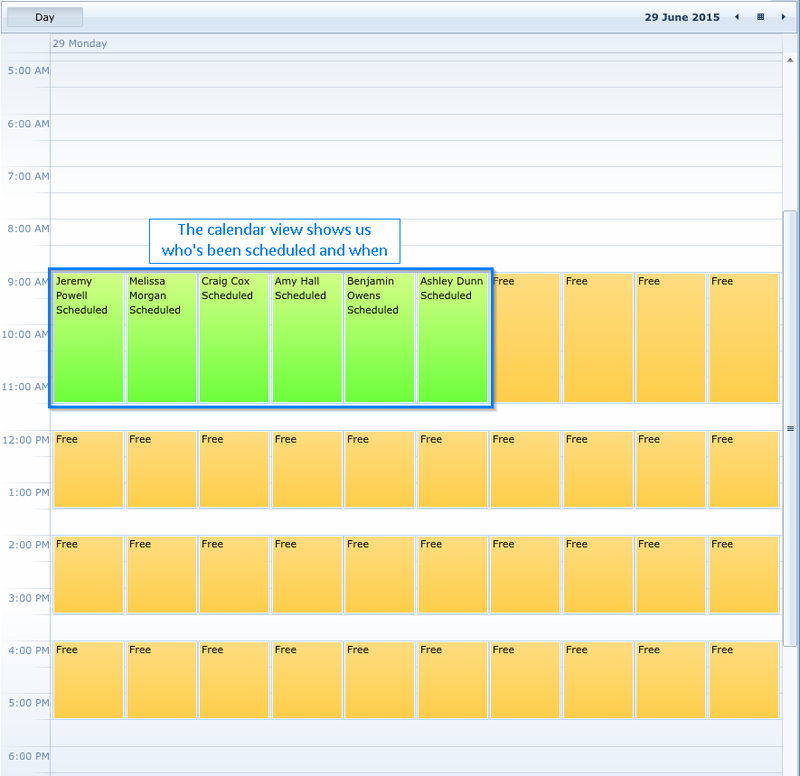 Tracking, remediation, scheduling, testing and making decisions on a companywide operating system release is complex. It would be extremely difficult to do this using Excel and Outlook. With the existing functionality of MigrationStudio combined with a toolset such as SCCM, this becomes a simple process. Application rationalisation is almost always one of the pain points during migration projects. In this video we take a look at how MigrationStudio and AppTracker support the various rationalisation decisions which are likely to be made. I think the best way to begin is with a basic question: why is now the right time to start your Windows 10 migration? In this article I’ll explain why it is, and also give you my recommendations on software tools to use and the approach you should take to make migrating to Windows 10 as trouble-free as possible. Remember how painful it was moving to XP and then subsequently how painful it was moving to Windows 7? Were you in one of the many organizations who left both migrations until the last minute, leaving you in a race against the clock to get off a legacy unsupported OS or be at the mercy of paying Microsoft a pretty penny for extended support? Why would you subject yourself to the same pain and pressure again? …your Windows 10 migration could be one of the last clear cut open opportunities to build from the ground up. Start now and give yourself more than enough time. Microsoft have made some major improvements to Windows 10, and although there were a few bumps along the way such as an inability to have total control over your Windows updates and lack of extensions with the new Edge browser, these issues have been (and are continuing) to get ironed out – Edge has several extensions available now with more to come. There’s also more control over updates in the Enterprise edition. Windows Server 2016 is now out, so there’s that desktop server pairing, plus available features such as Device Guard, Credential Guard, Windows Store for Business and App-V provide extra incentive. Justin Pickup and Fraser Norman discuss migration planning and optimisation. The transition to Windows 10 is going to offer a new set of challenges compared to previous migrations. In this webinar we will discuss the typical pain points you're likely to come up against, and demonstrate how an agile approach to managing the programme can save many months in the overall delivery. Thanks. We'll be in touch shortly to confirm your place. As a company we've been waist-deep in migration programmes for the last six years. This is because it's very common for our Application Management solution, AppTracker, to be used heavily during large-scale transformation projects. We've got first-hand experience of the pain points involved in delivery migration programmes successful, so we decided to build a 'one-stop-shop' solution which provides organisations with a portal where the migration can be planned, optimised, monitored and executed. This takes away so many of the common paint points experienced during migration and it allows organisations to save time and money as an added bonus. The short video below shows you the benefits of using MigrationStudio to manage your migration. This case study shows how AppTracker saved Balfour Beatty £640k and three months' time during their Windows 7 migration. 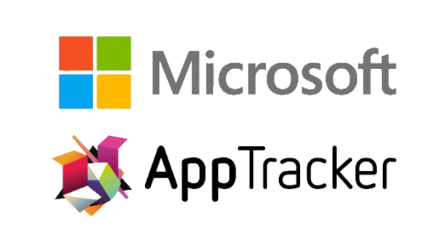 AppTracker announced today that the company has joined the Microsoft Enterprise Cloud Alliance Program to deliver faster, cheaper Windows 10 migrations and application management by utilising the Microsoft Azure cloud computing platform. The goal of Microsoft’s Enterprise Cloud Alliance is to create, nurture and grow a strong eco-system across a broad set of Enterprise Cloud Products delivering the best on premise, hosted and Public Cloud solutions in the industry. The Alliance was formed to promote and support partners providing integrations and extensions to existing Microsoft products. "AppTracker enables organisations to transition quickly and easily to new operating systems such as Windows 10 by taking feeds from many disparate systems and intelligently layering the data to make sense of it via a single, cloud-based IT migration portal. AppTracker reduces the costs and disruption of migration whilst allowing the business to continue functioning as normal. AppTracker provides optimised work-plans which accelerate the point at which deployment can begin. Migration programmes often struggle when the unexpected occurs. AppTracker's real-time "readiness to migrate" reporting and "what-if?" analysis ensure the project team have visibility of what is happening now, and what might happen in the future. 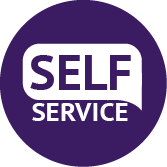 This forward-looking approach has repeatedly proven to deliver successful change programmes whilst reducing time, cost, effort and disruption." 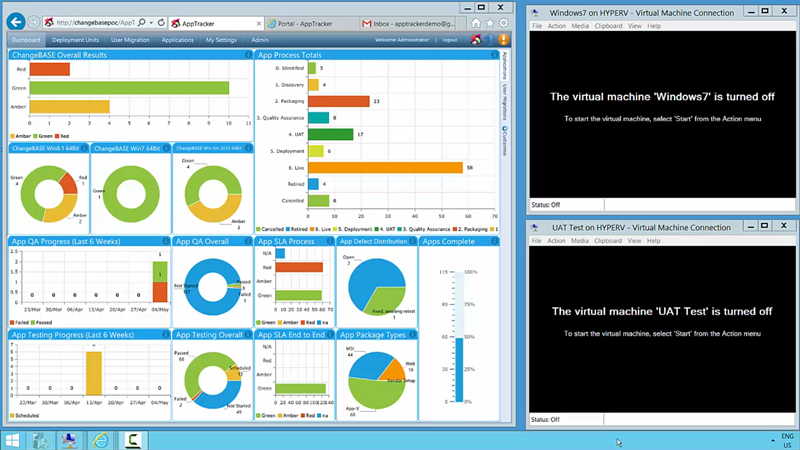 To learn more about how AppTracker products work within the Azure Cloud infrastructure, please contact us. AppTracker have been providing market-leading migration and application migration solutions since 2010. 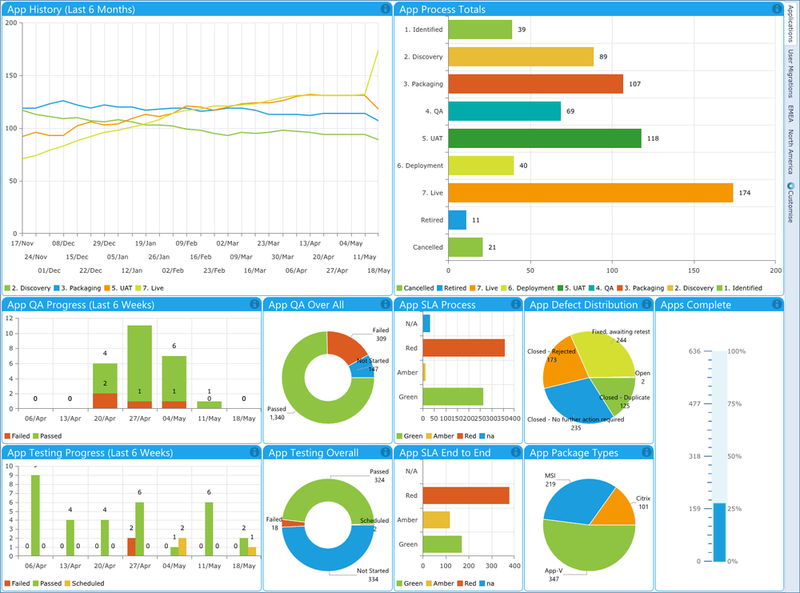 AppTracker provides the business intelligence, collaborative knowledge, workflow and automation to manage applications, users and devices. AppTracker presents a "single version of the truth" whether going through change or maintaining a business as usual environment. We are big fans of collaboration at AppTracker. Why? 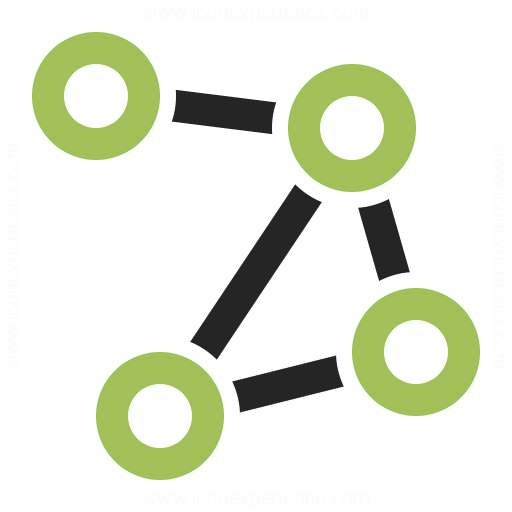 It allows us to obtain more value from existing systems by connecting them to AppTracker. A good example of this is where an organisation is about to undergo a transformation programme such as a Windows 10 migration. They need to understand what software and hardware is in use in the current environment to be able to efficiently plan for the migration. By connecting AppTracker to inventory solutions we can add a tremendous amount of value through migration planning and optimisation. This leads to significant time and cost savings. We've just added a new connector for Dell Asset Manager (a hardware and software inventory solution) and the results are impressive. AutonoWare & AppTracker are delighted to announce that they have formed an alliance to integrate Best of Breed solutions to help customers to accelerate the planning, reporting and execution process (AND save huge costs!) for application migration projects within a single integrated solution. AutonoWare www.autonoware.com delivers a fully or partially automated application source file (MSI / .exe / script) to Microsoft App-V conversion process with its software automation solution ConversionBox. The App-V sequencing process can be massively accelerated for >60% of an application estate from the standard 1 to 2 applications manually converted to App-V per day to potentially up to 250 apps converted to App-V per day using ConversionBox automation software. Pre-conversion reports are available to help determine which apps can / cannot be automated by actually installing each application on the target OS. The reporting details all errors / issues found during installation. ConversionBox typically saves many months of manual effort and the majority of the associated costs. AppTracker www.apptracker.co.uk is the market leader in ‘soup to nuts’ application lifecycle management and migration optimisation. Its unique feature set provides collaborative workflow management to accelerate each application’s journey from request to release; the advanced toolset allows you to remove the guesswork from migrations by adding real business context to provide planning and readiness reports. This reduces migration programmes by months, saving £1,000s. For starters, you can save a huge amount of time, cost and application complexity for your application migration, but it doesn’t stop there. 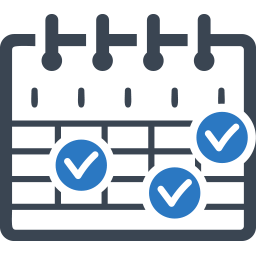 AppTracker provides the ‘tool belt’ to manage the process to aid your app migration project and ConversionBox is one of the integrated ‘tools’ to help to greatly reduce the time and cost to plan, report and execute within a single integrated solution. Migration programmes are transformed by optimising the workstream and automating the majority of application virtualisation effort, saving vast amounts of time and cost. Check out our 3 minute demo of ConversionBox integrated with AppTracker, delivered by AppTracker’s Senior Product Specialist, Ben Cook. Until 31st March 2016, AutonoWare and AppTracker are delighted to offer the following to new and existing AppTracker and AutonoWare customers. ConversionBox is then priced on a ‘cost per execution’ basis, based upon the results of the pre-conversion reports. A discount of 20% per application is available for AppTracker licenses for all AutonoWare customers. A collective discount of 20% per application is available for AppTracker and ConversionBox licenses when purchased together. Easy. Just contact AutonoWare or contact AppTracker to register your interest and we will arrange an initial call to discover your requirements, with a view to arranging a demo. IT spending has had a huge impact on many businesses over the last five years. The exodus from XP to Windows 7 was painful, slow and expensive. Many companies weren’t prepared for such a massive change. XP was like a colleague who’d worked alongside the business for over a decade, productively working away without too many issues. Then came the time to upgrade; technology was changing at a rapid pace. New processors, connectivity, tablets and better battery life would provide a more mobile workforce with better efficiency. Security became a major concern with numerous stories in the press of leaking information with viruses, trojans and rootkits becoming the word of the day. XP couldn’t cope and it was time to move on. As the desktop migration gathered pace Microsoft released Windows Server 2008, then Server 2012. With the focus and main spending clearly on the user experience, the servers were left behind. They just worked, almost 24-7, no real problems to report. The back end business chugged away as it always did. Then came the hacker collective: Anonymous, Global Warming, massive mergers and acquisitions and then a sudden realization that disaster recovery plans just weren’t good enough. Once again it was time to move on. Unfortunately, just like the desktop migrations, there was no information as to how these servers were built, how the applications were installed, who used them or what the external dependencies were. What would happen if these servers went off line? What would be the business impact? Who would be affected? Nobody knew. With no solid information, facing huge risk and no real financial gain, most businesses did what most businesses would do: They pulled the duvet over their eyes and said “Just five more minutes”. As Microsoft finally pulled the plug on Windows Server 2003 support in 2015 the panic was on. Punitive maintenance costs, major security concerns and a realization that businesses really had to become more efficient to survive. With a quick hospital pass back to the CTO the business has finally started to move. Windows Server 2003 must go. Similar to a desktop migration, each server has its own users, applications, dependencies. Additionally, there is a huge amount of documentation to discover, plans to go through, disaster recovery mitigation, change control, issue remediation, installation instructions and finally a migration day run-book to ensure everything goes smoothly. From early on, we realised that AppTracker could track anything. It was great for managing application workflow as well as user and potentially machine migrations. With the development of the machine migration side we realised that we could start to properly focus on server migration as well. There is a different methodology with server migrations and a lot more external dependencies, components and tasks to deal with that need to come together to co-ordinate the whole migration. With this in mind we changed the focus of modelling server applications to a Projects, Components, Tasks and Servers view. This means that we can now use AppTracker’s meta data defined knowledgebase, comprehensive API, dynamic reporting and communication capabilities to manage server migrations. In this case you can see we have used two servers: WEBSRV01 for the web server and SQL01 for the AppTracker database. We’ve assigned some very basic tasks and wrapped it all up as a project called AppTracker. In previous releases of AppTracker we've been able to track applications, users and the relationship between the two (i.e. who uses which applications). This has allowed us to manage migrations where the user is the focal point of the migration. In some scenarios we will be looking to manage the migration of the machine (PC, server etc) rather then the user. This might be a requirement in an organisation where multiple users share machines, or during a server migration. AppTracker 5 allows you to track these machines, their applications and who uses them. It provides machine readiness reports based on which applications are required to migrate the machine, and it allows you to schedule the machine for migration and print build sheets for the deployment engineers. You can then trigger SCCM tasks such as an in-place Windows 10 upgrade via AppTracker Custom Actions if needed. Anyone who's been involved in application packaging and virtualisation will have no doubt used the website ITNinja.com (previously known as AppDeploy.com) to get to the bottom of technical issues or learn how others are deploying specific enterprise applications. It makes complete sense to provide access to this resource from within AppTracker to streamline the job of those managing applications, so we worked with ITNinja's founder, Bob Kelly, to add this functionality. The new ITNinja tab in AppTracker allows you to search for deployment tips for the selected application, then pin them to the application for future reference. Whenever you revisit this tab you will get the latest set of tips, sorted in order of usefulness as voted by the ITNinja community. One of the biggest challenges facing applications teams is managing the ever-growing volumes of applications required by businesses. It's also quite typical for organisations to end up with multiple versions of the same application which is an additional overhead to manage. 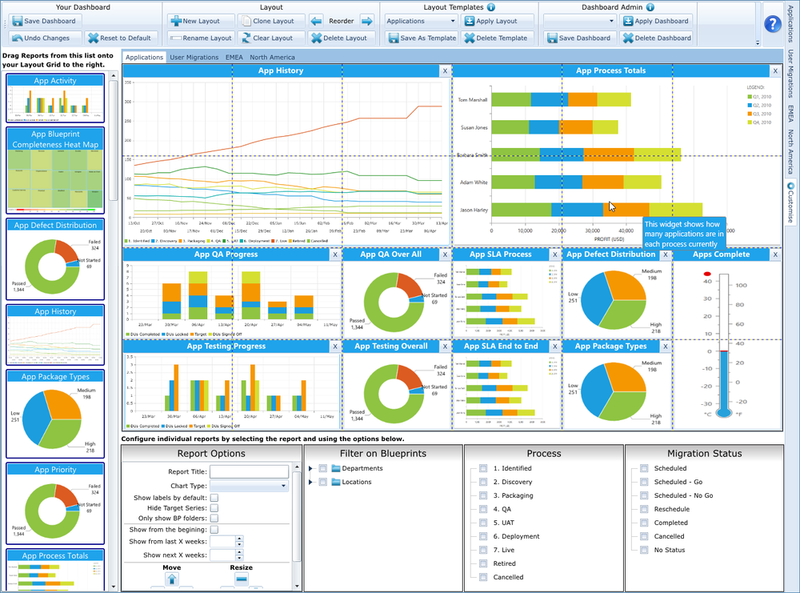 When AppTracker is used during a migration programme it is typically configured using a connector to regularly import the existing software inventory from third party solutions such as Centrix WorkSpace iQ, Snow Inventory and SysTrack Lakeside (you can alternatively import the inventory from Excel). This normally results in 1,000s of application records being created in AppTracker with multiple versions of the same product in many cases. AppTracker 5.0 allows you to take the multiple versions of a product and rationalise them down to a single "standard" version. It remaps the users of the rationalised applications to the "standard" version of the application. When these users are migrated to the new system this ensures that those users will receive the "standard" version of the product. In addition, when new users are detected by the software inventory tool, these are dynamically remapped to the "standard" versions of the software titles in AppTracker. AppTracker 5 ships with four new connectors. The AutonoWare ConversionBox connector allows you to auto-convert native installers into App-V format using ConversionBox without ever leaving AppTracker. The three new software inventory connectors allow us to run a daily import import of the organisation's estate including all applications, machines and devices which have been detected by the inventory tool. This is a fantastic starting point where an organisation is undergoing a large change programme such as a desktop migration. It allows you to utilise the new ADR rationalisation functionality on all newly discovered applications. AppTracker 5 supports Active Directory-based Single Sign-On (SSO). This allows AppTracker users to be automatically logged into the tool without the need to enter a username and password. SSO is supported on both on-premise installations of AppTracker and in AppTracker Cloud. In addition it is possible to configure AppTracker for anonymous access once SSO has been set up. This allows organisations to automatically log anyone in the domain into AppTracker regardless of whether they have an AppTracker account or not. The users with AppTracker accounts get the rights explicitly assigned to them. The users without AppTracker accounts get the rights assigned to a special anonymous account. This would typically be more restricted than a standard account. Anyone who's spent time as an application packager will have no doubt used the fantastic community site ITNinja to gain an understanding of how best to package and deploy applications. This is the number one resource for application specialists globally and has over 500,000 visitors per month. It contains a knowledge-base of over 350,000 software titles with over 7,000 deployment tips. As an ex-application packager myself I appreciate that fast-tracking repetitive tasks makes me a) more productive, and b) happier. Therefore it makes complete sense for AppTracker to be able to "pin" ITNinja deployment tips to each application, saving time and money by reducing the effort involved in locating the pertinent information each time it's required. We've been working closely with Bob Kelly and the team at ITNinja and we're very excited to announce that AppTracker 5.0 will be the first third-party solution to utilise ITNinja's API. See the video below for a demo. Captions are available if you don't have audio. ITNinja integration is available in both AppTracker Cloud and AppTracker (On-Prem). We've done enough transformation projects to know that good planning can reap huge rewards in the long term, so this week I wanted to focus on AppTracker's planning capabilities. The data in the screenshot below is from a real-life Windows 8.1 migration currently in progress. The traditional approach for the applications team is to start getting the 3,000 apps ready for the new environment. This involves discovery, packaging, UAT, release to Live etc. Once most of the applications (80-90%) have been through the full readiness process we can start to migrate our users to Windows 8.1. The issue here is that we have to wait 12 months or more before these 3,000 applications are ready. 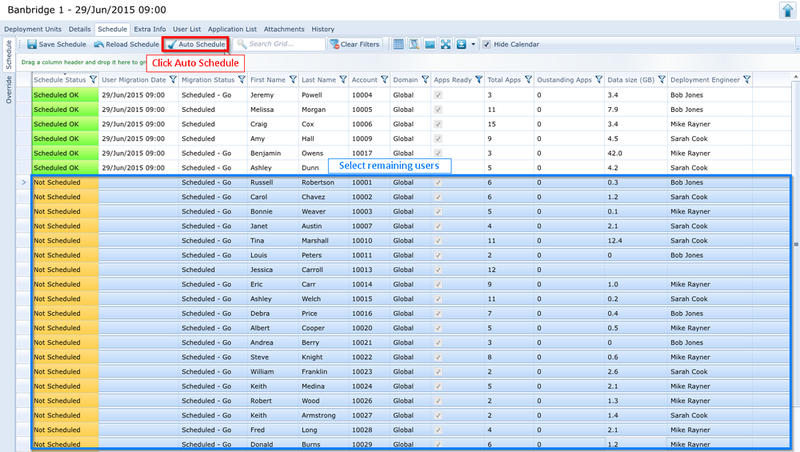 AAP allows you to specify how many applications the team can get ready each week. I chose 55 per week for this example. It's a big number, but there's a big team working on this one. 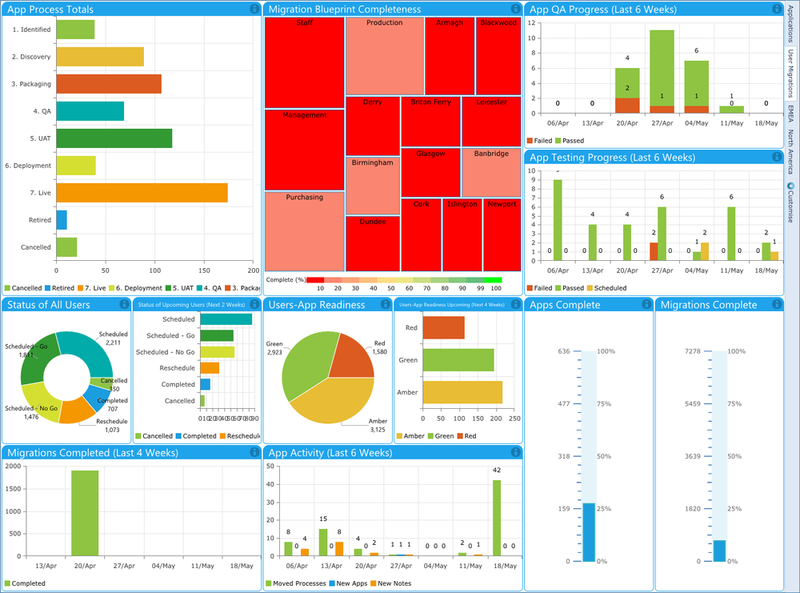 AppTracker looks at the data feed from the software asset management solution, and works out which applications you need to get ready each week based on which application the business use the most. Because AppTracker knows which users need which applications, it can then tell you when each user is ready to migrate. we can migrate 79% of the users"
What's new in AppTracker 4.5? How do I get AppTracker 4.5? Existing AppTracker users who are in maintenance are entitled to a free upgrade. For new sales enquiries please get in touch here. 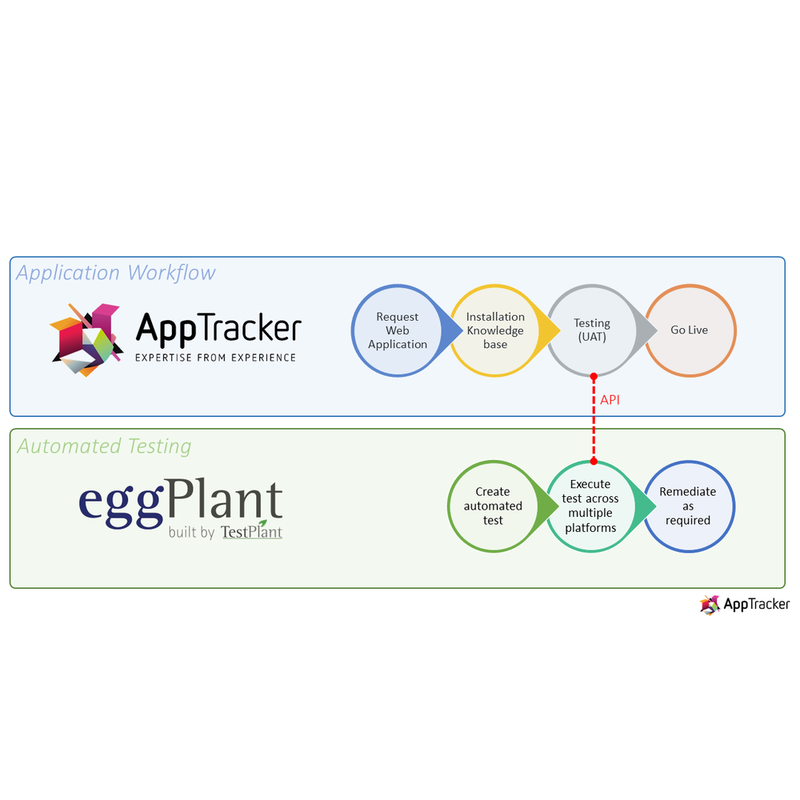 In my previous blog I showed how it's possible to manage an application's lifecycle, and automate the testing of that application by combining AppTracker with eggPlant. 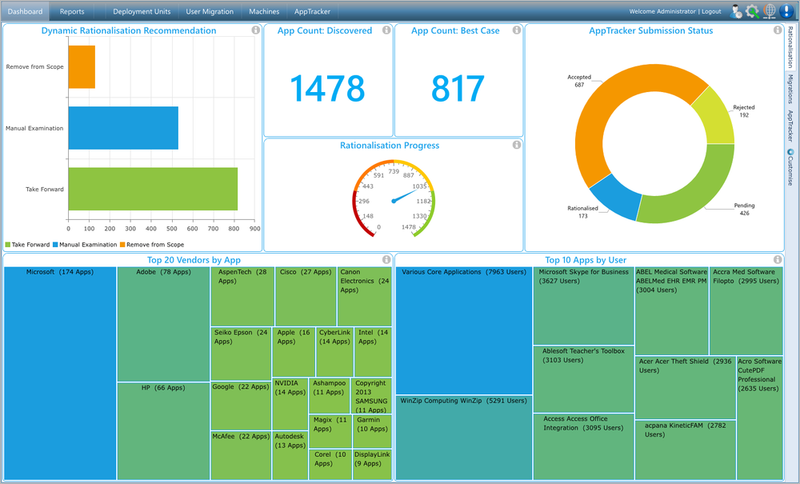 This week we've been looking at integrating AppTracker with Dell ChangeBASE. Here we are able to add application compatibility testing, and auto-conversion from MSI to App-V by integrating the two products. In the video we take an application from the initial request, through compatibility testing, then onto auto-virtualisation and finally through User Acceptance Testing. With this level of automation you can get a feel for how rapidly applications can be made available to end-users with minimal manual effort. During a recent conversation with a prospect we discussed web browser migrations. This organisation had recently undertaken a difficult browser migration and wanted to understand how we could help streamline future migrations. We demonstrated the application lifecycle management features of AppTracker and showed how this saves time and money through centralised collaborative workflow. They could see the value this would add, and wanted to understand how further efficiencies could be achieved through automated testing. We therefore spent a little time integrating AppTracker with a product called eggPlant and the results are impressive. As the video shows, you can now manage an application's lifecycle AND trigger batch automated testing through the AppTracker user interface. This kind of integration can be applied to any software which supports command lines or API calls. It opens up some very interesting opportunities for automation. Note that captions are available for those without audio by pressing the CC button.